The perfect and easy way to bring your lunch to work with you, dressing included! Peel and chop the sweet potatoes into cubes. Line a baking tray and add the sweet potatoes. Drizzle over some olive oil, and sprinkle over the spices. Mix together with hands. Bake in oven for 25-30 minutes at 200C or 300F, turning the potatoes halfway through. Meanwhile, drain and rinse the beans, chop the pepper and avocado, grate the carrot, wash the spinach and mix together the dressing ingredients. When the sweet potatoes are fully cooked, leave to fully cool. 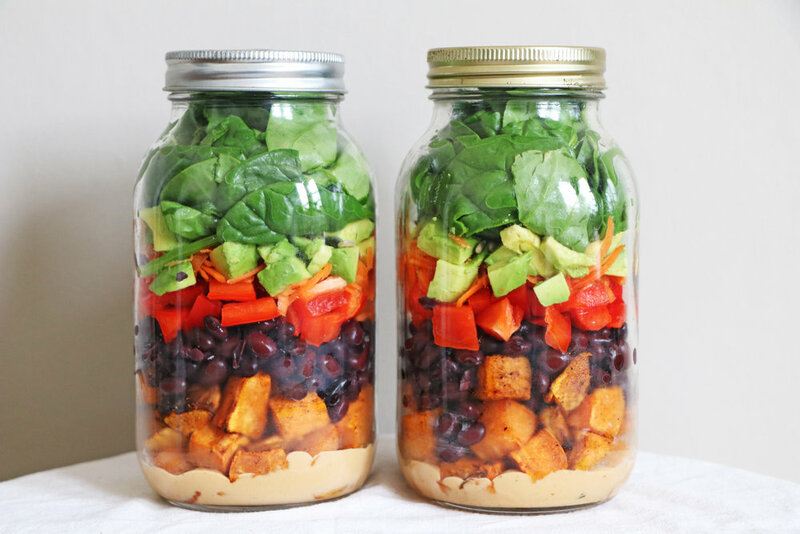 Layer up your mason jars with the dressing first so that the rest of the salad doesn't get soggy. Follow the dressing with your sweet potatoes as this will create a barrier between the dressing and other softer ingredients. Then add your beans, then your veg. Next, add the seeds and avocado. Finally add the spinach leaves and seal the lid. To serve, simply pour the ingredients out into a bowl or onto a plate. Use a spoon to scoop out any leftover dressing, and enjoy! This recipe can be followed and customised with any different ingredients you like! Just make sure to layer in this order: dressing, starch/grain, protein, veg, fats, salad. This way your salad will stay fresh for longer and can easily be stored in your fridge ready for eating.